The newest trend in Korean Beauty: Modeling "Rubber" Masks! The Gold Premium Modeling Rubber Mask by Shangree contains rich gold, nourishing Asian botanicals and special ingredients that your skin will love. It also contains caviar, jojoba, ginseng, silk amino acids and so much more! This amazing mask helps provide long-lasting moisture retention, remove impurities, re-energize and revitalize your skin. Each session will leave you with the appearance of firmer, hydrated, more youthful and glowing skin. Bowl and spatula not included and can be purchased separately. 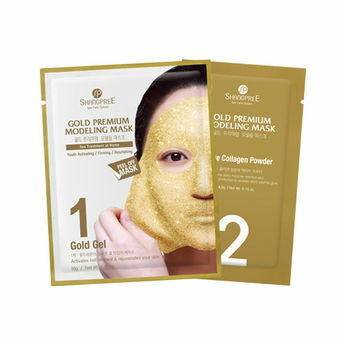 About the 'Shangpree Modeling Mask': The luxury peel-off face mask by Shangpree skin care line gives you gorgeous glowing skin. Shangpree rubber (or peel off) masks are the most intensive and powerful form of face masks with careful selection of ingredients, that are created to suit the need of most of the skin types. These unique modeling rubber masks seal-in ingredients, boost the skin's moisture retention and promotes collagen production to awaken skin's youthful glow. Explore the entire range of Masks & Peels available on Nykaa. Shop more Shangpree products here.